I finished in style; I had been worried I would not manage a 100 mile total in Janathon, and the planned run for this morning would still have left me short. Fortunately, I was able to organise the morning so that, as well as the four 800m fast session, I could add extra miles at the end. From time to time sleet fell, and when I turned into the wind I realised how cold it was. Tomorrow's run will be colder. At the end of Janathon, like every other participant, I give three cheers for JogBlog, the stern yet benign goddess who presides over our efforts. Day twenty-eight: swimming coaching, hard work, front and back crawl and pushing off from the wall and dolphin-kicking underwater. 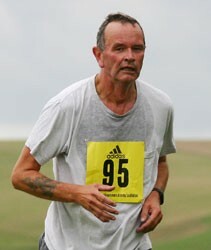 In the afternoon, a three mile run; in the evening the Seaford Striders awards ceremony. The guest of honour was Julia Armstrong; she was far better than some speakers at such occasions. The point I remember most is that she told us, based on her long running career, that one can always come back from periods of injury and set-back, and run again. Day twenty-nine: the long run, ten miles, to Bo Peep and back. The farmers are keeping their sheep off the high ground, perhaps fearing snow in the coming week. Woodpeckers drummed in the trees on the outskirts of Seaford. Once on the path to Bo Peep, I saw a bird of prey, too big for a kestrel. Even with my glasses I would be hard put to tell if it was a merlin or hen-harrier. And that was the end of the fifth week of marathon training. If yesterday's run was damp, today's was soaking. It began to rain as I shut the front door behind me just after 6 in the morning, and built quickly to a downpour. By the end of the first half-mile I was soaked, cold in the wind, and I never really warmed up. My legs were heavy and tired. I went to the seafront for the last two miles, but met no other runners or dog-walkers. I rose, reluctantly, at 6 and went out for four miles. It rained, a weak drizzle. At the end I felt no endorphic joy; I felt nothing at all. I long for extreme weather, cold or heat, anything but this muggy wetness. Today I ran a three mile fartlek, with a mile warm-up and cool-down. I find fartleks hard to judge. Do I push myself too hard, or do I take it too easy? For the latter, I sometimes find, when running a recovery section, that I have drifted off into a reverie, for example I might imagine myself in the basement swimming pool of the Royal Automobile Club on Pall Mall; the pool is empty apart from the actress who plays Isabelle so well in Birdsong. As I reach the end of a length I turn and see that her swimming costume has fallen off. Not wishing the poor girl to feel embarrassed, I strip off my Vilebrequin trunks, exclaiming, 'gosh, isn't modern workmanship shoddy? No one can sew a seam these days.' She turns to me, holds out her hand, and whispers huskily, 'Tom, chéri, there is no one to see us'. Gently, I....and then I realise I am on my own, running on Seaford seafront before dawn, and I really ought to speed up. The back continues to plague me. Consequently a four mile run today was the only exercise I have managed since Wednesday. I don't feel too guilty; better to overcome an injury early on in marathon training than succumb to one later on. In any case, the schedule required a 10K race today: ridiculous. Where am I supposed to find one of those on the third Sunday after Epiphany? So I made it out for four miles over Seaford Head. I think I may have disqualified myself from Janathon, but tant pis. This marked the end of the fourth week of marathon training, the first quarter of the programme, and I am not unhappy. I have fallen back into the habit of early morning runs, and have built up some miles. I hope, when I run again on Tuesday, to be back to fitness. Yesterday, a five mile run early in the morning. Today, nothing. I have been nursing a bad back since Monday, and it seems to be getting worse. What causes it? Too much driving, did I rick my back swimming back-stroke, was it when I carried a heavy load the other day? I have had back trouble before. Twenty years ago I went to see an osteopath, a very beautiful young French woman. I had to undress, lie on a couch and be manipulated. Alas, she left, and was replaced by a sweaty Australian man. Nevertheless, I think it did me some good. I always read Richard Lehmann's JournalWatch, hosted by the Centre for Evidence-based Medicine. It is always valuable, for the horticultural notes as well as for his witty analysis of the articles in the main medical journals. In the latest one he reports on a paper in the New England Journal of Medicine on the perils of marathon running. I love, though do not agree with, his conclusion, which I hope he will allow me to quote, ' If only the Persians had won: we might have a world free of marathons, Olympic games and unhelpful Greek medical terms like hypertrophic cardiomyopathy (or such really exotic examples as paragonimiasis)'. It seems if you're a young man, cardiac arrest will be caused by hypertrophic cardiomyopathy while if you're my age it will be the atherosclerotic coronary disease that does for you. Women don't seem to be prone to handing in the dinner pail mid-race. I have, I'm afraid to say, run in marathons when participants have died. Kim JH, Malhotra R, Chiampas G, d'Hemecourt P, Troyanos C, Cianca J, Smith RN,Wang TJ, Roberts WO, Thompson PD, Baggish AL; Race Associated Cardiac Arrest Event Registry (RACER) Study Group. Cardiac arrest during long-distance runningraces. N Engl J Med. 2012 Jan 12;366(2):130-40. With that off my chest, let me tell you about this morning's run. Up at 6, I went out for four fast 800m runs, with mile warm-up and cool-down, and quarter-mile recoveries. At first my legs would;t work, but I think I managed the fast sections tolerably well, even the first one, which was on an unlit rutted lane. The sixteenth day of Janathon: My dear, the noise! And the people! The art of swimming has little to do with progress through the water, and much to do with how to outwit one's fellow swimmers. I think I may have discovered the optimal time for a morning swim. At 7 am, when the pool opens, I feel like that Guards officer at Dunkirk who is supposed to have exclaimed, "My dear, the noise! And the people!". Go an hour later and it is very different. So I accomplished 300m, as the endurance programme prescribed, in comfort, with only one or two other swimmers in the pool.